I just returned from a trip to Sydney and Perth in Australia. The objective was a family reunion with the cousins I grew up with, but for me it was also a reconnection with the plants that filled and influenced my early childhood. Australia has amazing plants – many, such as the various Eucalyptus trees and the yellow-flowered Acacia or Wattle tree (Acacia pycnantha), are familiar sights here in Sonoma, but there are also lesser known native plants that are drought resistant and available from nurseries in the US. 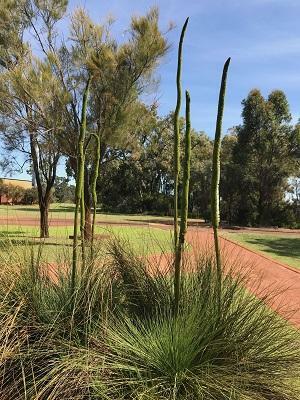 Some of the most architectural and recognizable plants are the various species of Xanthorrhoea or Australian Grass Tree (though most Australians seem to use a colloquial name derived from the appearance of the aging flower stalks, it is not “politically correct”, so we’ll stick with the official names). 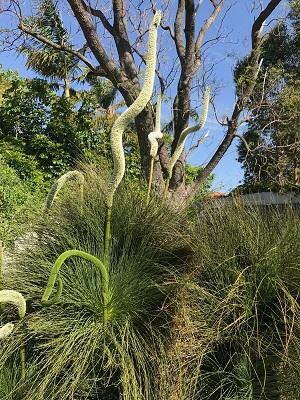 In particular, Xanthorrhoea preissii, known as Balga, is available from a well-known known nursery who’s plants can often be found at local nurseries and are available both at the parent Richmond nursery and on-line. This plant is slow growing and will spread to 3’ x 3’ in 7 – 10 years, with the trunk eventually increasing in length to achieve a tree-like form reaching a height of 8-10’. It needs well drained soil, and is hardy to 15 -20ºF.